The next day begins with a morning seminar on the Eleusinian Mysteries, followed by a visit to Eleusis, the sanctuary of Demeter and Persephone. Their story of loss and return was ritualized in the death/rebirth mystery rites which were held annually for more than one thousand years in the ancient world. We will pause by the Well where Demeter mourned the loss of her daughter, the Cave of Hades where legend recounts Persephone’s abduction into the Underworld, the great Hall of the Telesterion where the mysteries were revealed, and the museum housing much of the art excavated from this site. 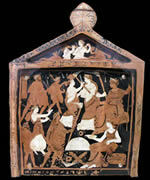 We will honor the goddess of agriculture by sharing a celebratory luncheon at a taverna adjacent to her site. 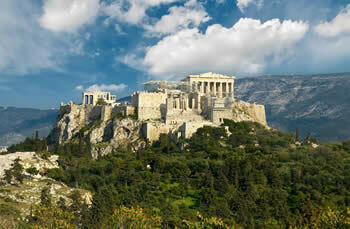 The remainder of the day is free to explore Athens on your own. B, L.
The next day, after a morning seminar, we immerse ourselves in the dramatic natural beauty of Mt. 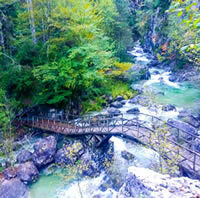 Olympus National Park, home of the Gods and the Muses. We will drive up the mountain to Prionia (1660m), picnic by waterfall springs of the Enipeas river, recite Homeric and Orphic hymns to the gods, and explore the mountain trails suffused with springtime wildflowers. For those who wish, there will be an optional one-hour guided downhill hike over streams and through meadows to the ruined monastery of Agios Dionysios. B, L.
We spend today exploring the countryside around Drama, known for producing the finest wines in Greece. Myth has it that Dionysus himself introduced the local lords to the secrets of the vine, and that they in later times helped spread its cultivation to the rest of Greece. After a visit and on-site teaching at the Sanctuary of Dionysus in Kali Vrysi, we will explore the Aggitis River Cave and lunch in the adjacent riverside café. 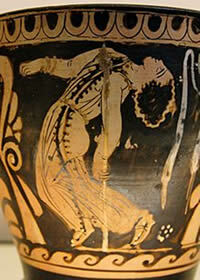 Then we offer libations to Dionysus with a wine-tasting at a nearby winery. The peak of our journey culminates tonight during the climax of Anastenaria ceremony. Initiates who have been dancing for several days carrying icons of saints, become ‘enthusiasts’ filled with the spirit of the god and walk over burning coals in order to bring healing to community members. 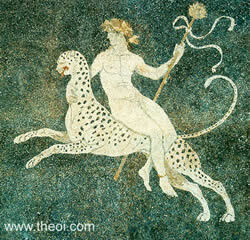 Folklorists suggest that this contemporary ritual carries vestiges of ancient Dionysian worship. Board the ferry for the three-hour sail to mystical island of Samothrace for the next three nights. 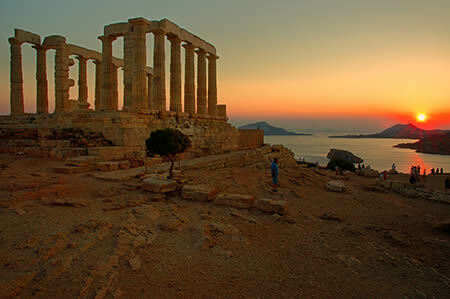 The summit of the towering mountain peak dominating this island is where Poseidon “kept his watch” over the Trojan War. 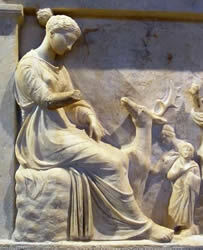 The Samothracian Mysteries were renowned throughout Greek and Roman history and yet still remain enigmatic, a well-kept secret sworn by initiates. After a morning seminar, we will wander through the pristine and spacious Sanctuary of the Great Gods where nocturnal torch lit ceremonies involved two stages of initiation, the myesis and epopteia. Cybele the Great Mother of the mountains worshipped at sacred rocks, the Kabeiroi, Demeter, Persephone, Hermes, Hades, Dionysos, and Orpheus all had cults here. 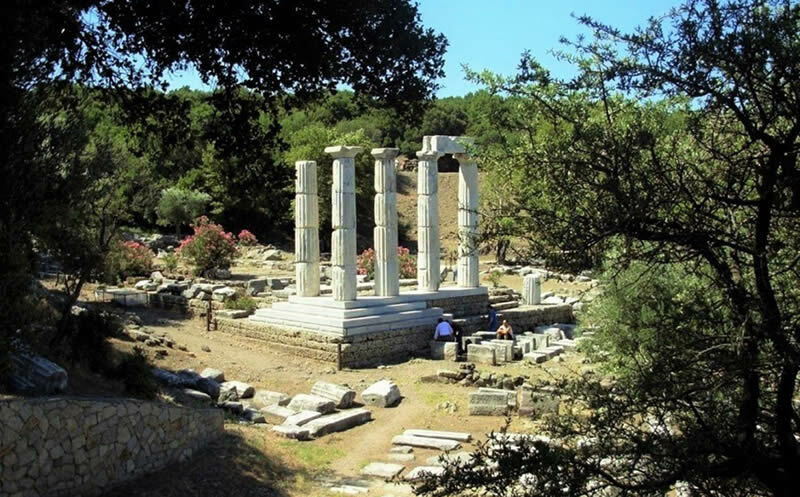 Our second day on Samothrace is free to explore on your own. You might want to take a boat tour around the island; soak in the sacred hot sulphur healing springs at Therma; hike up Fengari, the highest peak in the Aegean islands; take a more leisurely one hour walk up the Fonias stream with its abundant waterfalls and pools in which you can bathe; go on an excursion to the mountain village of Chora with winding cobbled streets, whitewashed Thracian style houses, local handcrafts and culinary specialties; or swim and sunbathe on the long beige sand beach in the center of the south coast. B, Overnight in Samothrace for 3 nights. We take a late afternoon ferry back to Alexandroupoli where we rest overnight at our elegant seaside hotel. You can arrange transportation to the airport (35-minute drive) or back to Athens (1 hour) if you want to continue the Greece adventure on your own.